I am pleased to announce the inaugural season of the Race for the Regions Hospital EM Residency Conference Cup. One of the lynchpins of a residency education is the dedicated weekly didactic conference series. While I’m sure we all have fond memories of our conferences and work tirelessly to craft solid educational offerings for our residents, anything that happens over and over (and over) can get a little…hmmm, stale…especially by the end of the academic year. This year, we are going to make things a little more interesting. Thought leaders from Academic Life in Emergency Medicine (www.aliem.com) and the Council of Residency Directors (www.cord-em.org) created a Hack-a-thon allowing a few lucky EM faculty to practice design thinking. We were asked to tackle a hypothetical scenario, “The Case of the Catastrophic Classroom.” I worked with some stellar colleagues to design a solution that was awarded top prize in the Hack-a-thon. Our idea was “The Conference Cup”. But this process got much more interesting when discussing what I learned with my coworkers from Regions over dinner that night. They wanted to actually do it. This was a much simpler idea when it was imaginary. But the imaginary idea wouldn’t die, and here we are kicking off our first season. How it works: All of our faculty and residents have been assigned to one of four teams that will compete through the year for “The Conference Cup.” Players score points for their team by a variety of ways, mainly showing up to conference, filling out evaluations, and displaying knowledge. Methods of scoring were agreed upon by leaders of each team. Since not all of us are huge sports fans, we opted to name our teams after something with a broad appeal – the Houses of Hogwarts School of Magic. Teams are led by the residency leaders and chief residents. We will post standings and some commentary on our residency website every couple of weeks so you can follow along and cheer on your favorite team. This introduction would not be complete without some heartfelt thanks. Thank you to Drs. Teresa Chan, Catherine Patocka, Robert Cooney, Jeremy Voros, and Therese Mead, who created the Hack-a-thon. I cannot claim the idea as my own. This was a product of my Hack-a-thon team, Team All-In – Drs. Alexandra Grino, Jordan Spector, Leslie Oyama, Antonia Quinn and myself. And this imaginary idea turned into a lot of fun (and work) thanks to my Regions colleagues (see the slide above) as well as Lori Barrett and Amy Koonce (who make things actually happen). Apologies for the lack of analysis the last few weeks. Blame it on the day job. Gryffindor and Slytherin each lost a player this week to retirement from the league. On the flip side, congratulations to James Frederick and Mike Cavanaugh on their graduation from our PA residency. Dr. Ashley TeKippe has been pulled up from the minors (AKA Sports Medicine Fellowship). Welcome to the faculty, Ashley. She’s been drafted by team Slytherin. We are halfway through MSK month in conference, so I feel like I really need to push the sports metaphors this month. Congratulations to Dr. Ashley TeKippe on winning the MVP award for conference last week. That’s how you make your debut in the Conference Cup Race. Last week, for the first time, Hufflepuff did NOT win the evaluation point tally outright. They tied with Ravenclaw. Good job Blue Team! I took some time today to look at trends. Here’s the cumulative score for each team over the past six weeks. Gryffindor continues to lead the Race for the Conference Cup despite a rough week 4. Hufflepuff got within 28 points. But now Gryff is widening the gap just a smidge. I’m encouraged that each team seems to be trending simlarly. Let’s look a bit closer. Ravenclaw has been hit or miss. Great weeks, then not so great. Gryffindor is typically strong but had that bad week. Hufflepuff stays steady. But keep an eye on Slytherin. Sure they aren’t winning cumulatively, but look at the trend. The Green Team has steadily improving scores after their disastrous week 2. 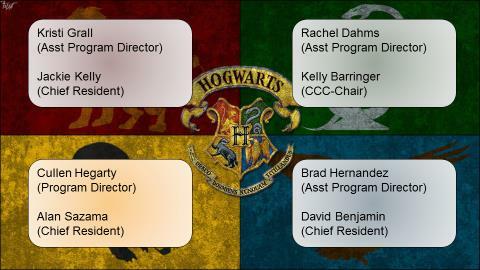 My concern when this started was that there are more residents on Hufflepuff and Ravenclaw than the other two houses. More residents means more attendance points, right? But Gryffindor is winning so far. Why? Looks like faculty conference attendance is doing it. 6 faculty members scored points for attendance on Gryffindor (and Slytherin, by the way?) last week. Ravenclaw had 4 and Hufflepuff only had 3. Check the graph above to see the effect that has. Thanks to all of you for the enthusiasm for the Conference Cup (even you, Lefevere).